Casterley Barn, the new events and conference centre project, being built at Rushall Organic Farm in Wiltshire, was bought to the Energy Solutions’ Off Grid team by Ramsbury Electrical, an experienced electrical installation company who were looking for the most efficient way to power the centre off grid. There were numerous issues to consider in order to ensure that the centre had sufficient power for all types of events, from conferences to weddings, at any time of year. The power needed to supply lighting, security, media and also a kitchen with catering appliances – and at times additional equipment from external caterers as well. 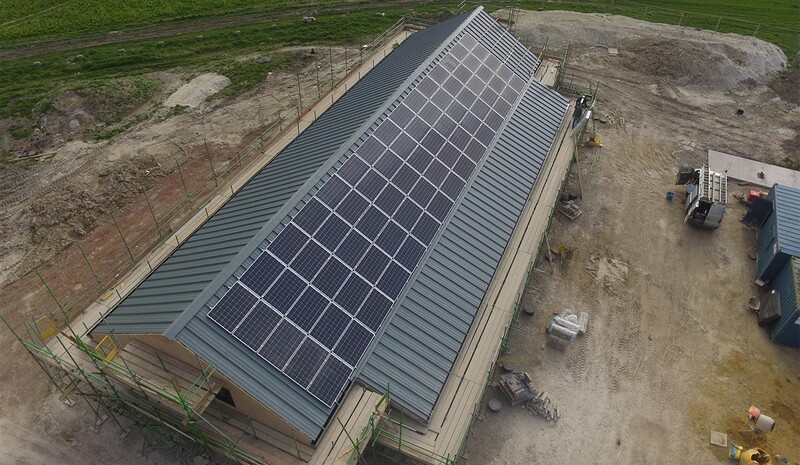 With a full review undertaken by Ramsbury, a complete off grid power system was specified - including a 25.2kW solar array, 36kVA generator (supplied & installed by RPM Consultants & Engineers Ltd) and EasyGrid 10000 with in-built 3G router & two solar string combiner boxes. The purpose of the EasyGrid is to bring the external power resources together in the most efficient way possible for cost and application. The off grid system is designed so that power from the solar array can be stored within the EasyGrid for use as and when needed, day and night, winter and summer. Then as a back-up option, should power demands be very high, for example with the additional equipment from outside catering, the system has been designed so that the generator can feed those loads directly. Ed Pope, Ramsbury Electrical Director explains “We had investigated a component system for the off grid power, but having seen the capabilities of the EasyGrid range there was no question it was the right solution for this project. As the units are preconfigured, tested and upgraded where necessary by Energy Solutions, we knew that the unit would deliver the quality and reliability we needed whilst saving time on the installation. With the adjustments Energy offered us we were able to install the solar array we felt offered the best solution and to get remote monitoring (via the addition of the 3G router) from the EasyGrid where a wi-fi connection wasn’t available. We were able to install a tailor made solution, delivered as one complete unit."